MOSCOW, Dec. 10 (Xinhua) -- The Kremlin said Monday that the allegations against Russia about its involvement in the recent large-scale protests in France are absolute "slander". "Any allegations about Russia's possible involvement are nothing but slander. Russia considers everything that is happening an exclusively internal affair of France," Kremlin spokesman Dmitry Peskov said in a briefing. He added that Moscow attaches great importance to the development of Russia-France relations, on which both sides are working hard. 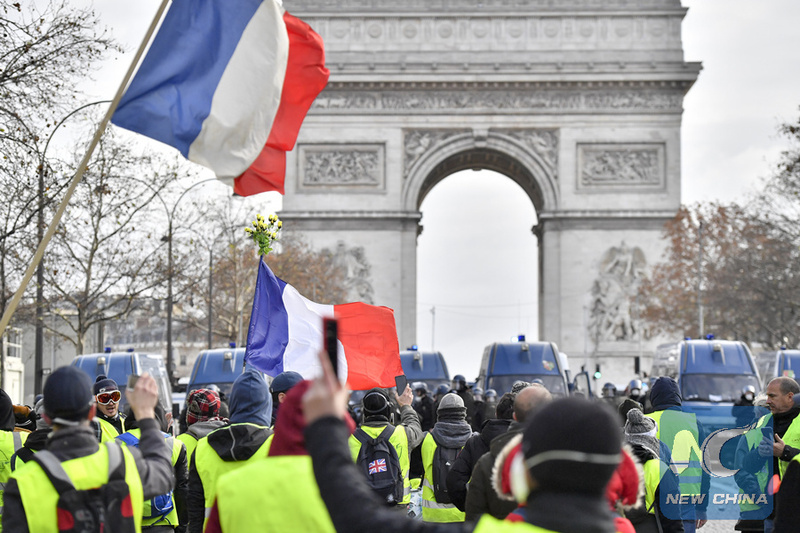 The "Yellow Vest" movement, which got its name from the fluorescent jackets worn by protesters, began on Nov. 17 in opposition to the government's planned fuel tax hikes. Ukraine's security services and British newspaper The Times said that Russia might have played a role in whipping up France's nationwide protests. French Foreign Minister Jean-Yves Le Drian said Sunday that the French authorities would launch investigations into Russia's alleged interference in the protests. "We have not interfered and we are not going to interfere in the internal affairs of any country, including France," Peskov said.